Your best choice for a beautiful house, and you always get proper care to match every new brick to your home. Your replacement brick is the best possible match because we use 15-20 manufactures to find the perfect match (When most companies just use one or two). 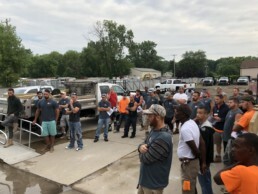 Also, we deal directly with several leading brick manufactures including the Belden Brick Company, Glen-Gery, Hanson Owens Corning, and General Shale just to name a few. This guarantees you flawless chimney repair job that will last for years to come. Within the past 20 years there has been a dramatic change in brick-style texture and size, and all of these things are considered when choosing the best match for your home. 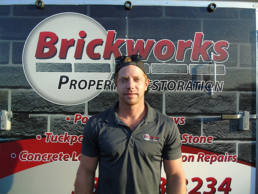 Brickworks Property Restoration always stays current with the latest masonry standards and techniques and uses only experienced pros that get your job done right. We have multiple-trucks and crew operations, and we’re certainly no fly-by-night outfit. For the last 11 years we have grown our customer-base largely from referrals from very satisfied customers just like you. Brickworks Property Restoration always uses our own special mortar (Never store-bought). This conceals the brick repair to your home leaves no attention to areas where your repairs have been done. You won’t see mismatched bricks, discolored mortar, or even hard unblended edges. Our staff will carefully blend the new brick with the old and naturally color the mortar for a perfect blend to your home. You get the very best mortar for the job. We have gone to great lengths to make our work stand above the rest, and by custom making our own mortar this guarantees full-flexibility with color, strength, and longevity. a management role, influencing others and showing them his way of leadership, knowledge and community. He works hard to ensure Brickworks standards are far above the norm to deliver excellent service. 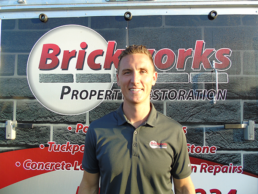 Jeremiah currently holds the following certifications: CSIA, CCP, CCR, HeatShield, historically accurate mortar, lime mortar and residential builder’s license. He has worked for hospitals, schools, corporations, historic landmarks, governments, police stations, city halls, the list goes on. Daryl Nilsen started as a laborer and has worked hard every day to learn new innovative solutions and to advance his career in the skilled trades. Daryl now works as an Operations Manager, overseeing multiple jobs and crews each day. 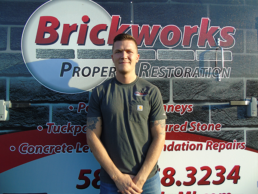 He enforces safety standards and best practices throughout the company to make sure Brickworks is operating at 100%. Daryl loves working with his hands and having the opportunity to work across all of Southeast Michigan. He also has an appreciation for dogs of all breeds and classic cars. our company. Ian is a dog person so don’t be worried about putting away your dogs!